This article is continued from the previous page… Click here to jump Back to the Beginning. One of the most important areas to use time against a thief is in break in time. Burglars generally don’t want to spend more than a minute breaking into your house, especially if they’re out in the open where they might be spotted. The point of break-in is also your last chance to keep them out of your home. Over a third of forcible entry attempts fail before the burglars get into a home (sources), so this is a good area to spend some time on. How you do that depends on your resources and imagination. There are lots of resources available on the internet and at your local police crime prevention unit to help you. Below are lots more ideas. Most thieves do not bring their own tools, because they don’t want to be caught walking around with “burglary implements”. Even if they do bring tools, they may not have the right one(s) they need to break into your house. Look around your yard for “tools” that a thief could use to get into your house. Any tools lying around should be kept locked up, especially axes, sledgehammers, shovels, etc.. Think like a thief. “If I had to break in and didn’t care how much damage I did, what could I use?” Decorative stones sized between a brick and a cinder block are convenient for thieves to break windows and door locks. Thick pieces of lumber or firewood can be used as a battering ram to break open your door or garage door. Door Jamb kicked in by the author. I later repaired and reinforced it with the plywood. 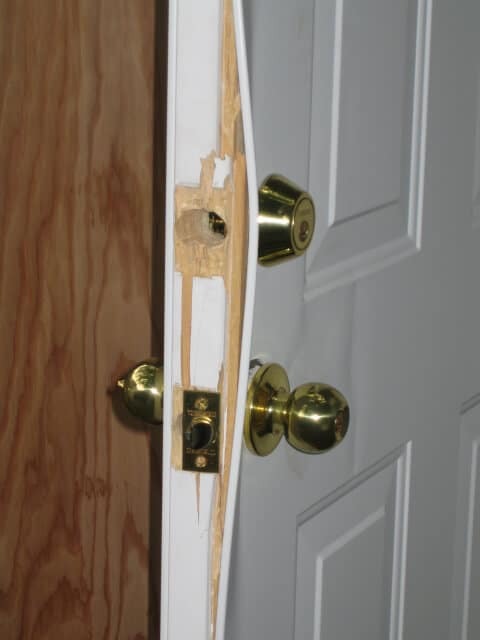 53% of burglars enter through a door, and the most common forcible entry is to kick in a door (sources). Doors should get a lot of your attention. I kicked in a door myself once (shown in the picture) and found that this is remarkably easy. I had left some tools in my detached garage that I needed on a job site. On our lunch hour a friend drove me there, but when we arrived I realized that I had left my garage keys back in my truck. It was a 25 minute drive back to the job site and I didn’t feel like wasting another hour driving back and forth to get my keys. I had been meaning to reinforce the door jamb anyway, so I tried kicking the door open. Even though it had a deadbolt, it opened on the first kick. The kick popped out the strike plates for the deadbolt and door knob, splitting the door jamb where the strike plate screws went. This is pretty common. The jamb was so weak that kicking in the door didn’t damage the door or locks at all. After the deadbolt hole is drilled in the jamb, there just isn’t much “meat” left there to hold the deadbolt. You can see from the pictures that the deadbolt extends through the strike plate into the door jamb, which is 3/4″ thick wood, often pine. There are a couple studs in the door frame, but most strike plates are installed with screws that only go into the weak 3/4″ jamb. Even if the screws do go all the way into the door frame, there is an air gap in between the jamb and frame used to shim and adjust the door. The strike plate is just too far away from the studs in the wall to make the door jamb strong enough. 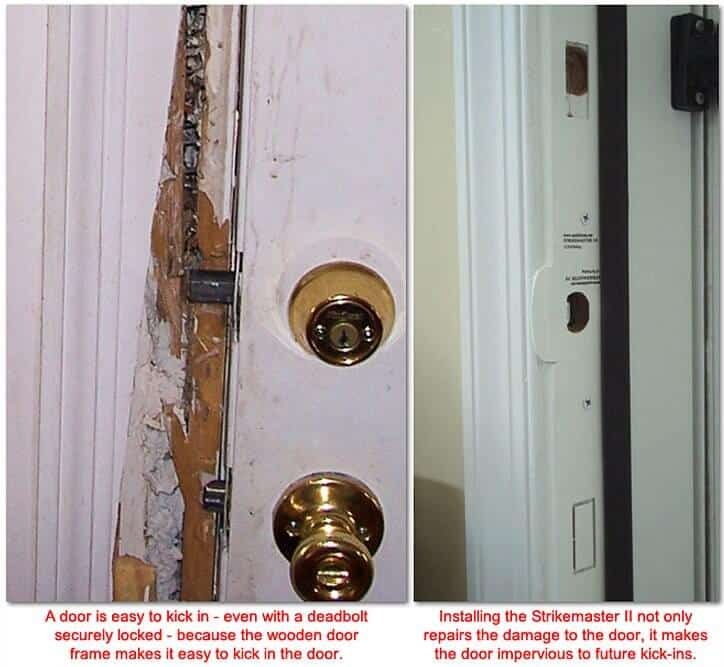 A number of companies make door jamb armor, which replaces the strike plates with a single steel plate running nearly the entire height of the door jamb. In a kick-in, the deadbolt and door lock hit the door armor, which spreads the force out along many feet of the door jamb. The door jamb armor is screwed all the way into the door frame with many screws, instead two short screws of the strike plate. The same problem of door jamb reinforcement goes for sliding glass doors, which are notoriously easy to break into. The sliding door lock usually latches by a hook sliding into a slot in relatively thin aluminum jamb. It can be ripped right out. Many of these doors can be pried off their tracks as well. 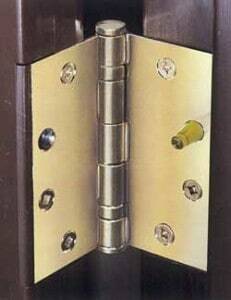 One of the simplest security devices for these types of doors is a Charley Bar. I’ve cut 1″ wooden dowels and dropped them in the track for this purpose, and also lived in an apartment that had the unit pictured above already installed, which worked really well. Once the door jamb is secure, the next part to worry about is the vulnerable area between the locks and edge of the door. Even new steel faced security doors like the one in the picture are vulnerable to the deadbolt ripping out of the door. Door reinforcers can help hold your door together. The best type clamp under the dead bolt and wrap around the front, side, and back of the door. They’re available in a number of finishes including white, brass, nickel, stainless steel, black, antique brass, etc.. Replacing the original 3/4″ hinge screws one at a time. The new screws are 3″ and secure the hinges all the way through the jamb into the studs. Most doors come pre-hung with short screws that only sink into the wood of the door jamb (generally only 3/4″ thick). Usually these screws are never replaced with longer ones. 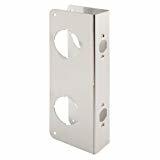 The hinges should be screwed through the door jamb into the wall studs for strength and security, especially on exterior doors. Doing so also helps with many common door problems caused by loose hinges. The tiny original screws on the closet door in the picture pulled loose right after I put a hinge pin doorstop on it. For exterior doors, buy corrosion resistant flat-head Phillips screws, 2.5″ or longer (galvanized, stainless, or brass). Remove the hinge screws one at a time, and replace them with the longer ones. For screw holes near the outside of the door jamb, make sure to aim the screws inwards towards the stud (you may need to pre-drill them). Dipping the tip of the long screws in a little dish soap will help them go in easier. Once the door jamb, locks, and hinges are reinforced, the next part that will fail is the door itself. If you’ve been meaning to update your doors, do so. It will be cheaper than a gun safe and help keep all of your valuables and your family more secure, not just your guns. But once your doors are resistant to kick-in, the next thing to worry about is your windows. After doors, the next most common area of forcible entry is a first floor window at 23% (second floor windows are 2% of forcible entries). 3M and a number of other companies make security window film which is remarkably strong at resisting break in. They also offer security films for enhanced privacy that make it harder to see in your house, and tinted window films that can keep you home cooler in the summer. Tinted films may make the project tax deductible as an energy saving home improvement. This video is a little long winded, so I skipped to 4:30 where it shows attacks to a window by throwing a cinder block at it, hitting it with a baseball bat, and later hitting it with an adjustable pipe wrench (“monkey wrench”). Here’s a real security video showing a store window with this film getting attacked. If you have old fashioned multi-lite windows with multiple panes of glass, security film may not be as much help. The muntin or interior wood frame between the individual panes of glass adds another failure point. Also installing security film on all those panes will take longer, but it still could help you if a thief tries to break a single pane to reach in and unlock the window. If you get window security film, go with a name brand like 3M or well reviewed product. Some of the generic products have problems with creases, scratches, foggy areas in the film which you’d then have to look at every day. A lot the cost of installing security film is labor, so using cheap materials that you might have to install twice could be a big time waster. Many older homes have windows with old locks on them that can be pried apart with a large screwdriver, or locks that don’t even line up and lock anymore. Replacing bad window locks with higher security versions is a great idea before buying a gun safe. After doors and windows, the next most common location of forcible entry is the garage. Garage doors are notoriously weak entry points. 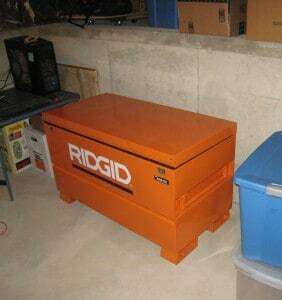 The burglars who attacked this gun safe with a Sawzall got in through the garage door in the middle of the day. They opened the garage door in seconds using a coat hanger and a garage door emergency release attack similar to the one in the video below. The gun safe was in the garage, so they sawed it open and left with the guns after only a few minutes. Just putting a cable tie (Panduit) on that latch can prevent this type of attack. 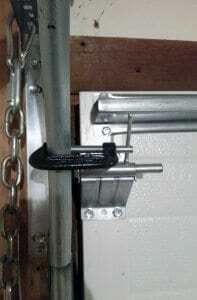 Install C-clamps to block your garage door tracks. This also works if you want to keep the bottom cracked for ventilation. Once a thief is inside your home, you want to make it take as much time as possible to find your valuables. The better you hide your valuables, the more likely he will leave without finding your good stuff. If he’s just looking for valuables, he will probably grab as many things as he can find in a few minutes and leave. That is, unless he sees something worth staying for — like a gun safe. If the thief knows ahead of time that you have guns, he may keep looking until he finds them. Look at the most common places burglars look and avoid storing things there. Put your gun safe in a location that makes it less vulnerable to thieves. More on this in the next article Where to Put a Gun Safe. If you’re looking at gun safes, avoid models that don’t have a UL 1037 Residential Security Container (RSC) rating as a minimum. These start around $800, or $1000 for made in the USA. Maybe you don’t want to spend that much, just want something to keep your children out, and/or realize you can’t afford the protection you want right now. If this is the case, a toolbox is a great option. 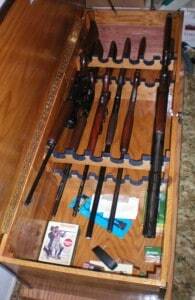 Job Box or Gang Box style toolbox storage chests make great horizontal gun safes. They are cheaper than a gun safe because you don’t pay for useless cosmetic features like chrome handles. They will generally give you better protection for your dollar than a cheap gun safe, too. No one has any idea there are guns inside. Guns are stored in their cases, ready to go to the range. 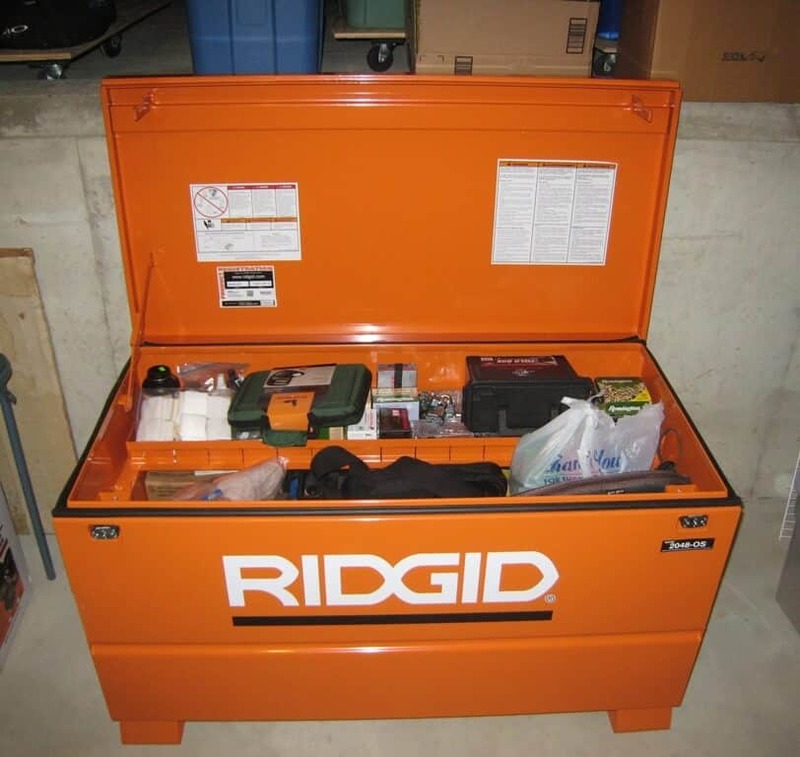 Tools are a popular item for burglars so a toolbox isn’t an ideal hiding spot. But, it’s better than a gun safe which immediately says “guns inside!” A tool box is less conspicuous. 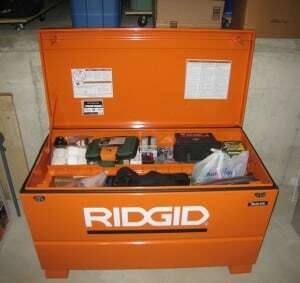 Make sure you bolt the tool box down or chain it to something for the same reasons as a gun safe. Also, as a reader pointed out, locks are the weak point of job boxes. Make sure to buy the best locks you can find. Another concern is that a job box will probably not be the best choice for high humidity locations, even with a gun safe dehumidifier. Toolbox storage chests are also convenient because they open up so you can see inside. They’re convenient to leave your guns in the bags/cases. When you want your gun just unlock it, grab your cases, and go. Update: This reader liked his toolbox gun safe so much that he bought another to hold his ammo and tools. Versatility is another plus. If you ever upgrade to a gun safe you can find many uses for the tool box — to lock up your tools, ammunition, use it to store and hide your empty gun cases, or sell it in the classifieds and get much of your money back. 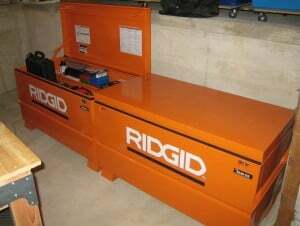 Speaking of which, if you have time to wait, you can probably find a used toolbox for cheap on online classifieds like Craigslist. A reader of this site took my advice and looked online for a toolbox. He found a few but then wondered, “What could I get today?” An hour later after a $250 trip to Home Depot he had the tool chest in these pictures, and was very happy with it. No one notices it in his basement. If he gets a gun safe, he plans on using it for tools or empty gun cases. He’s also going to enclose and reinforce this part of his unfinished basement, making it into a closet gun safe big enough for his reloading bench. Update: A couple months later he bought another one for ammo and tools. Two of them and four locks keyed alike were still cheaper than a gun safe. A school or military locker can be harder to break into than a cheap gun safe, and are a lot cheaper. They have the added benefits of not looking like they have guns inside and are easy to camouflage as a chemical closet. Instead of a gun safe, you can build a spot in your house to store your guns like a false wall, floor, or ceiling panel. The toe-kick under kitchen, shop, and other cabinets is another overlooked area with a lot of potential. Several toe-kick drawers are shown in the video above, which I found on Dan Perkin’s website after he left a comment. One guy in a forum realized that the floor joists ran parallel to his bedroom closet. Instead of getting a gun safe he cut a 2′ x 4′ rectangle in the carpet inside his closet, cut the subfloor so it overlapped the joists, and built a box to store his guns between the floor joists. He mounted the carpet back to the section of subfloor, which made the carpet line hard to see when the hiding spot was closed. A couple pairs of shoes and boots on top made it very inconspicuous and easy to get to. The hiding spot got tested when he was moving out. He forgot to lock the door and the rest of the things in his old place were all taken. The thieves didn’t find his guns though, which were still in the floor. You can do a lot with some carpet, drywall, plywood, lumber, paint, hinges, magnet latches, cabinet locks, and other common hardware. All it takes is some imagination and labor. It will be much cheaper than a gun safe and less likely to be found by burglars, even if you move out and forget to lock the door. 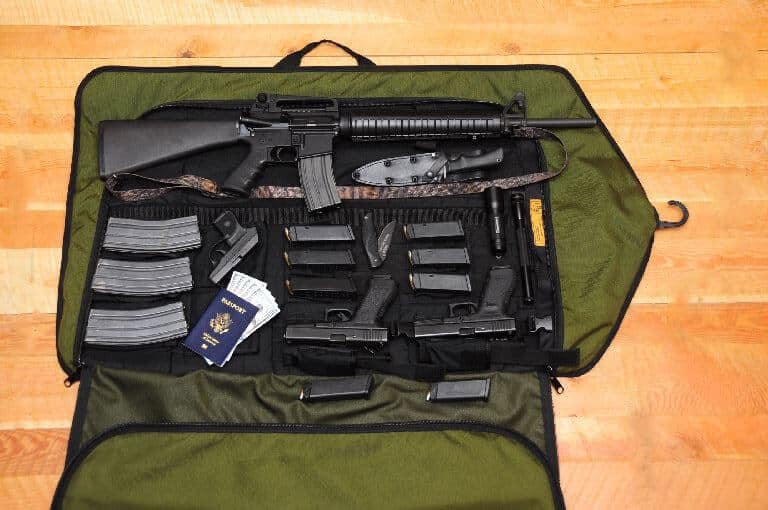 There is no limit to the ways you can hide your guns in plain sight. You’ll find many ideas below to get you started. Look around your home and think of items which could be used to conceal your guns and valuables. Whenever hiding your guns, make sure that you design something that is secure but can be accessed easily. An overly complicated hiding spot which takes too long to access won’t get used. And, you’ll wind up leaving your guns outside it, defeating the purpose. Put some thought into it before you take the saw to a piece of furniture. 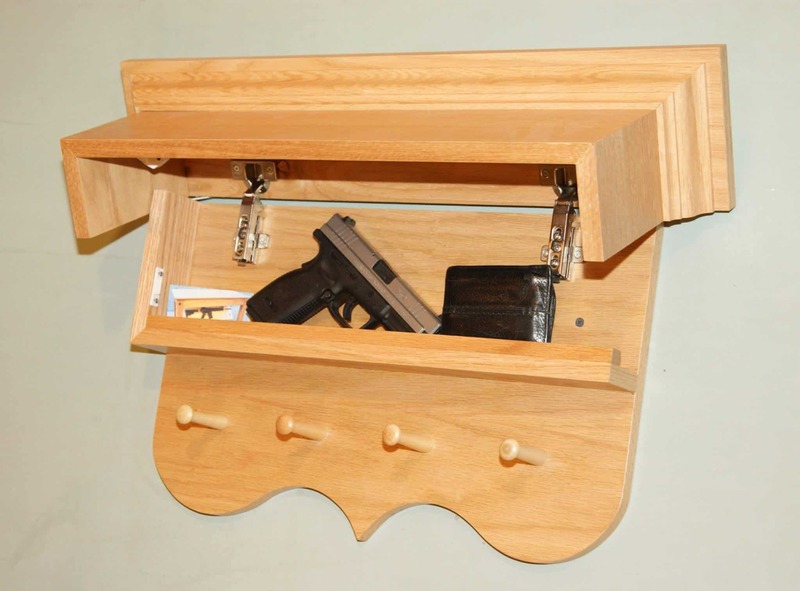 Some types of “hidden gun safes” are difficult to lock. If you have to control access to children, your options may be more limited. 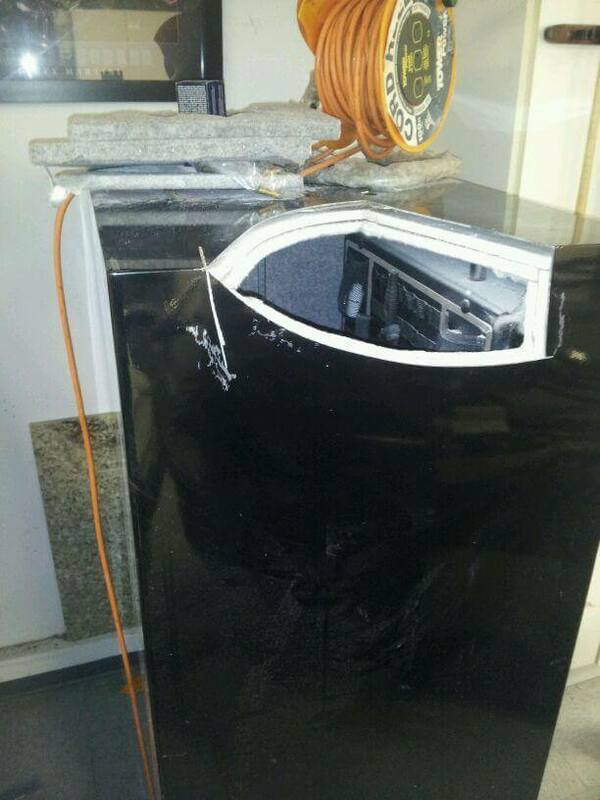 One gun forum member’s father made a gun safe out of an old refrigerator. It was the type of refrigerator with a single door operated with a big latch and a small ice box inside. He removed the interior, installed a gun rack, and replaced the door latch with a key locking version. After putting it in the basement utility room between the hot water heater and (real) spare refrigerator, it looked like it belonged there. You could do something similar with an old freezer chest. Who steals clothes? That’s a question asked by Skinner Sight’s HTF Tactical Garment Bag. Hung in your closet, it looks like a mundane garment bag holding an old suit. Open it up however, and it accommodates a 40″ long gun, two handguns, 3 rifle and 8 pistol magazines, and also pouches for knives, flashlights, and accessories. Pay no attention to the boring clothes in the closet. It also doubles as a way to conceal guns on the way to the range, and you could use it as a low-profile bug-out bag. 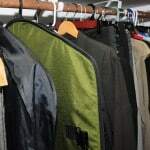 If you or your spouse are handy with a sewing machine, you could buy some ballistic nylon, elastic, and Velcro and custom make your own out of an old garment bag in your attic. Customize the interior for whatever you want, and you could add a locking zipper. Hollowed out books are classic hiding spots. You can make one yourself to fit a gun, or buy one already made for you. 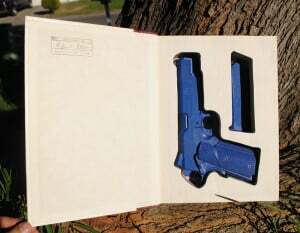 Artists make books cut out to fit pistols from full size 1911’s to Glocks to the Ruger LCR. To find them, search for “book safe” on Etsy.com, a website where people sell homemade craft items. These can sell fast, and are limited by the availability of large enough books. An artist might do a custom one for you if you ask, especially if you already have a big enough book. Horizontal gun safes are convenient for storing long guns. You could hide and lock your guns in a horizontal filing cabinet with drawer labels like “Tax Returns 2015 to Present”. Robust long horizontal filing cabinets with key locks can usually be found at your local used office supply store for a fraction of the original price. Most models sold at office stores these days are too flimsy and overpriced. Vertical filing cabinets can also work if the drawers are all removed except the bottom, and drawer fronts are then bolted together vertically as one big drawer. 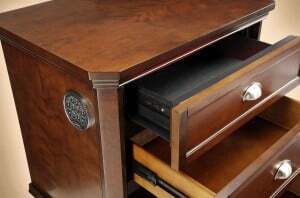 Hidden gun safes can be made from old wardrobes, armoires, chests, coffee tables, or other large pieces of furniture. Make a false back, bottom, or toe kick to it which will fit long guns and handguns. They’ll be much less likely to get the attention of a thief than a gun safe, and you can probably figure out a way to lock them. I see another company making some kind of concealment wood products at each gun show I attend. Traditional furniture manufacturing may have moved offshore, but demand for domestic concealment furniture seems to be healthy. A bedside dresser drawer can be converted to a hidden gun safe by buying a UL 768 Group 1 electronic keypad and installing it so that it locks the drawer shut. You could remove the fold out bed from a couch and in it’s place weld in a secure box using a UL rated electronic lock, hiding the keypad on the side or under an armrest. The couch may even be more comfortable with a solid foundation. You can make a wall safe out of an old electrical panel by gutting it, screwing it in your wall between the studs, and getting a locking handle for it from your local electrical supply store. You could take an old water heater and rig the shell, or part of it, so that it slides up or hinges to reveal your guns inside. A water heater gun safe wouldn’t get a second look in your basement, garage, or a closet in the Southwest. I’ve also seen pictures of old soda vending machines turned into hidden gun safes. Pinball machines or vintage arcade games could hide guns, especially given how little space a flat-screen and game console would take up in an old arcade game housing. 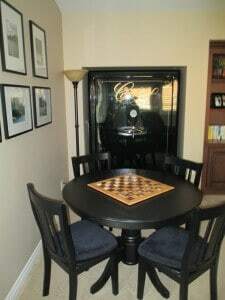 Gun Safe in Dining Room. Unfortunately almost everyone who comes into your house will see it. Gun safes are conspicuous. Instead of using it as a show piece, one of the best things you can do for security is to hide the thing (unless it’s a decoy). 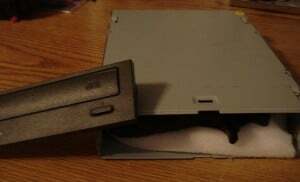 Several hidden gun safes are shown in the video above. One reason this is important is a home invasion/robbery scenario. With a gun to your daughter’s head, if the robber knows about the safe, you’re going to open it. Another use for the shell of an old refrigerator is to hide a gun safe. You open the door to the fridge and then unlock the door to the gun safe or gun cabinet. One forum member picked up large boxes of feminine hygiene products at Costco. He cut them out to cover his gun safe. I’ll wager a burglar probably isn’t going to go rummaging around in a stack of industrial sized tampon boxes. 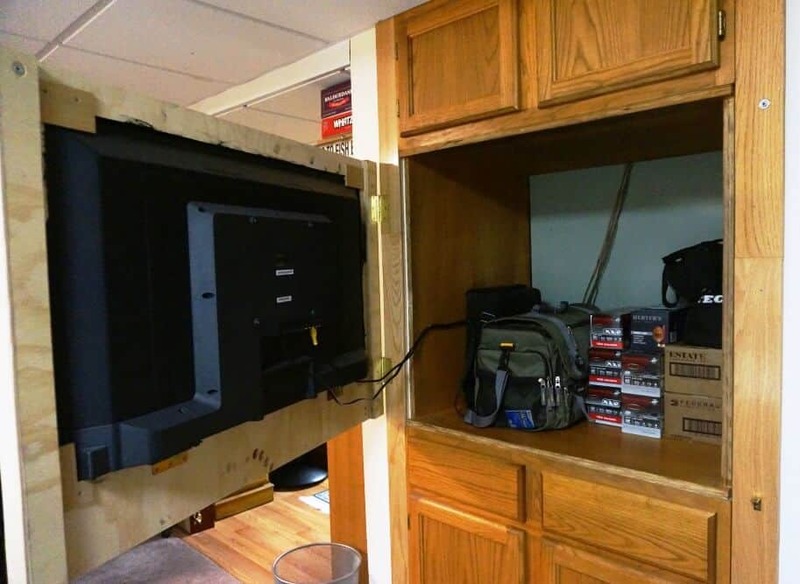 You can make a fake wall, bookcase, or access panel that swings open to reveal the door of your gun safe. 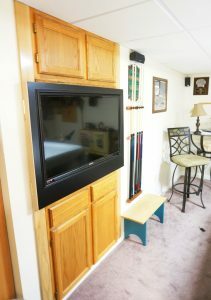 A reader used a flatscreen TV to conceal the built-in area for his old tube TV. This type of area could easily conceal a handgun safe and other emergency supplies. The new flatscreen TV is mounted on a hinged wood frame which swings open for access to his ammo and shooting bags. A positive latch is hidden on the bottom right corner of the frame. The latch release protrudes through a small hole underneath. When closed, there is little evidence that anything is behind the TV. He’s since finished the molding and built out the back of the frame so it locks into the wall opening for strength. Of course, a burglar may try to steal the TV and find the cache behind it. But you don’t have to use a burglar-target like a TV for concealment. Given how common built-ins are in houses, the options are endless. Even just putting your gun safe in a closet other than the master bedroom closet (which thieves are sure to check) can increase its security significantly. You can conceal a wall gun safe with a framed picture or mirror hinged to the side as well. Concealing your gun safe is a great layer of protection, but don’t do so at the expense of overall convenience. Put some thought into how quickly you’ll be able to gain access to the gun safe. If you’re planning on a hidden wall for example, a removable panel will get annoying and scratch up the wall when you set it aside. Instead attach the panel with hinges and a hidden latch or lock. It may seem silly to lock up your gun safe, since your gun safe is supposed to lock people out all by itself. But even banks have locks on their doors, and cages around their vaults. Security is about layers. If your gun safe is located in a closet or other room with a door on it, why not lock that door too? This will serve two functions in helping to hide your gun safe, and keeping burglars out before they even know what’s on the other side of the door. A deadbolt, secured hinges, and a solid core door between a burglar and your gun safe will add another layer of protection to your guns. The last option is the cheapest and works the same way that the fixed locking bolts on a gun safe keep the door closed even if the hinges are cut off. 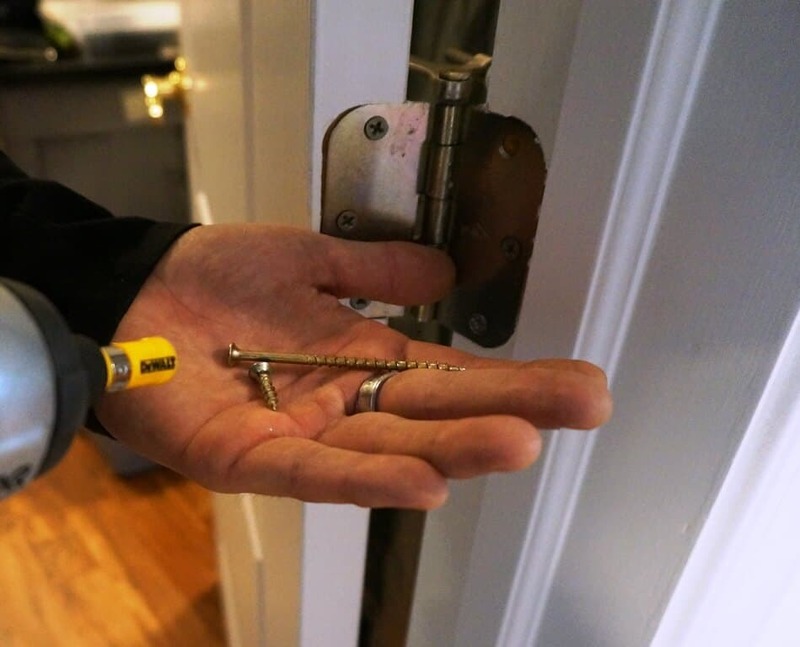 To put a passive deadbolt between the door and jamb, first remove a matching pair of screws from both door and jamb in the middle of each hinge. Then install a headless nail, hing jamb pin, piece of all-thread, or HingeMate insert deep into the screw hole of the door jamb, leaving it to stick out about 1″ to 3/4″. Finally drill out the screw hole on the door side. When you close the door, the deadbolt should fit into the hole in the door, holding the door on even if the hinge pins are removed. If you can’t hide your gun safe, maybe you can camouflage it to make it look like something else. This will be easier if you get more utilitarian model with a locking lever instead of a multi-spoke locking handle. Alternatively, you can replace the multi-spoke locking handle with a lever yourself. Did you save money by buying a beat up used gun safe or scratch and dent model? 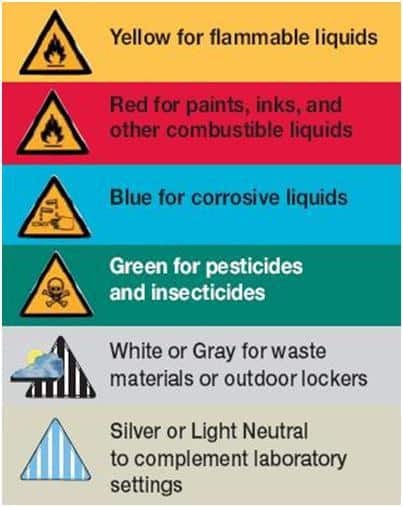 Paint it electrical cabinet gray and pass it off as an electrical closet. Mount it in the corner of a utility room or closet and attach fake electrical conduit out the top and/or sides. A Danger Electrical Hazard sign on the front will complete the camouflage. You can conceal the lock dial or keypad on the front with a double gang junction box with a hinged cover. Or if you have an electronic keypad lock, you or a safe technician can move the keypad to a fake wall mounted junction box. Or, you can make your gun safe look like a chemical cabinet that stores pool chemicals, fuels, acids, reloading powder, pesticides, or something else that isn’t of value to most thieves. Paint your gun safe an appropriate color and include the proper signage. If you’re worried that people know you have guns and someone may break in looking for them, try a decoy gun safe. Decoys are also one of the few solutions for a home invasion/robbery situation where an assailant is threatening you and your family if you don’t “open the safe”. 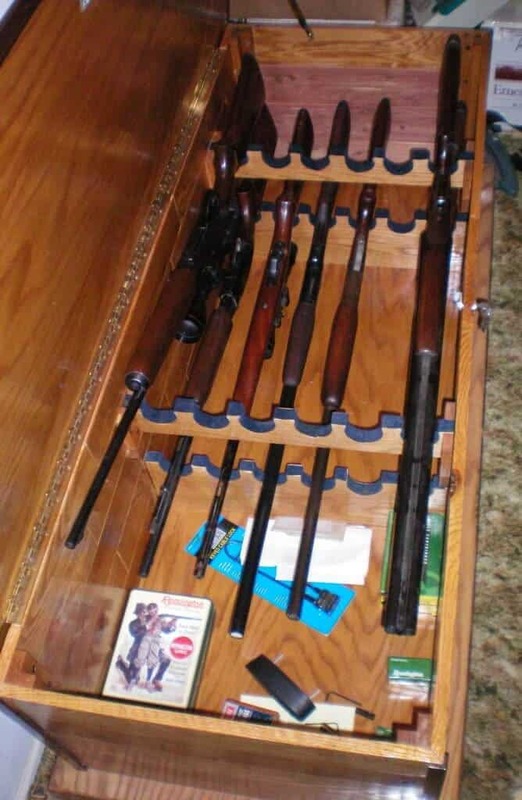 Whether your real collection is in a hiding spot, gun safe, or real safe, make sure to hide it well. Let few people know about this. 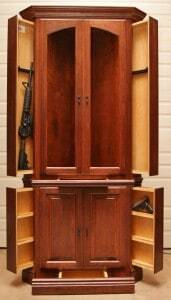 Then get a cheap Residential Security Container gun safe or gun cabinet. Put it somewhere that is easy to find but won’t attract unnecessary attention, like the corner of your bedroom or closet. 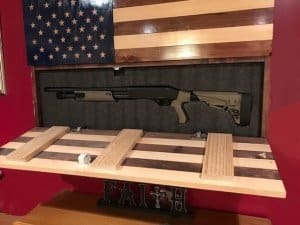 Store your lower quality guns in the decoy gun safe. An added benefit is that your rusty old barn shotgun and the .22 that grandma used to use to shoot crows off of the bird feeders won’t take up room in your expensive gun safe. If you want to put your ammunition in a gun safe, put it in the decoy safe so that it can’t ruin your good guns in a fire. If someone breaks in, the decoy gun safe is likely to keep them busy. Even though it’s a decoy, make sure to bold the decoy safe down to take up as much of their time as possible. If they’re able to get inside they’ll probably leave with your crappy guns without finding the real stash. If your spouse were to return from the mailbox with a gun to her head, you’re going to open the safe and hand over your valuables. With a decoy gun safe, if the robber is convinced of the contents, you have an extra chance of getting him to leave without finding your good stuff. What do you think? Leave a comment below, your thoughts are welcome. I was thinking the same thing. So creative. Good job. There is a major flaw in Job Box boxes. The locks can be drilled out easily. Its happened to friends. After showing someone how to do it when they locked the keys inside that very person drilled out the locks and stole their nailguns and purposed destroyed the collated nails that were also inside as they lost their job there. We used to get into the full sized containers yanking on the lock with a chain and a forklift since its hidden up inside to make it more secure. This also was done when a boss left his keys inside. Great points, thanks for your comment. It’s important to understand the level of protection you’re getting for your money when you buy protection for your guns. As Framer points out, the weak point of job boxes is the lock(s). This isn’t an area you want to skimp on, so buy the best locks you can that fit your job box. He also pointed out the importance of locking up your tools, which the reader in the pictures did with a second job box (the combined cost of both job boxes was still about half of a basic RSC gun safe). Leaving drills or other tools accessible outside the job box hands burglars a way in. Job boxes are best for those just looking to save money on a cheap gun safe, keep their kids out, not draw attention to their guns, and avoid/deter basic burglaries. If you’re looking for more protection than that, you should consider something stronger than a job box as Framer noted. Job Boxes can be positioned so that there is only enough clearance in front of the locks to get a hand in with a key. Then fill the bottom of the box with 500 pounds of lead shot and tie it down with a couple of redhead bolts. Won’t stop a well-planned assault, but will stop most folks. Might as well force them to saw the box open, which is a long noisy job. The statement that a home invasion forcing you to open a safe is a robbery, not a burglary, is incorrect in Pennsylvania and I would suspect everywhere. Entering an occupied building with intent to commit a felony (robbery) is burglary. is involved, it does not matter, it’s still a max of life. That’s quite a list of tips there. Interesting to note the NRA insurance has to be activated. That feels a little sneaky to me, but maybe I’m misunderstanding something? I wasn’t a big fan of the requirement for activation either. It’s moot now though as the $2,500 in free coverage (after activation) is no longer advertised. Very impressive list of ideas – some of which I have exploited and others that I’m definitely going to deploy soon. It would also be interesting to see a full inventory of collected breached/cracked/stolen gun safes, true safes, makes, models, residential/commercial, etc. Did anybody compile or maintain a list? There are pictures here and there, but no central repository that I know of. Safe techs generally avoid posting pictures of breached gun safes and safes. One major reason is that from these images you can tell how a particular unit is constructed. Some of this information, particularly the lockwork, is useful information for other thieves to defeat that model. Another complication is that using images online involves getting rights or the permission of the picture owner. Since some people have posted pictures using emails/accounts that are no longer valid, it makes things even more difficult. I was able to share most of the interesting pictures I found and I linked to others. Thanks for reading! Was looking for good ideas to use to store cell phones and other important items within our store.It is a hassle to take everything home each day. I saw a great idea San Jay Duty had for using a job box. If there is a break in,I figure that the culprit will know that the devices are in the job boxes but I’m only concerned about them not being able to take the box or get inside before police respond to the alarm. Very good article and comments! Glad you’re finding some ideas. Job boxes are a popular option. This section discusses using a job box as a gun safe. The nice part is that if your needs change or you upgrade, it can be used to store tools, ammo, etc..
On one of the bolts used to bolt down your RSC type gun safes, have someone weld a heavy duty eye bolt on top of it and use an open end wrench to tighten it down. Have a high strength, coated steel cable made with crimped loops in each end. A plastic coating will prevent scratching. Run the cable through each trigger guard and use a high quality lock purchased from a locksmith to lock the ends of the cable. Now even if they saw into the top or side they’ll have a devil of a time dragging the guns out. If they manage to breach the door they’ll still have to deal with the cable. No safe or vault on Earth is impenetrable. Even an ISM Treasury safe only buys time. Everything you can do to slow them down will help. Thanks for the new idea! Of course the more stupid theives will try and pry it open rather than [those methods]. Its like my brother’s Ford F350 superduty. The internet is probably full of utube videos of how to easily break into one. Kinda of like Rangers are easy from under the handle. A company makes a anti theft plates that bolt inside that area someway in a number of trucks. But along came some idiot that attempted to turn the door key lock with a flateblade screwdriver most likely and just twisted out the locks metal so a key won’t go in anymore. Some are just low tech and low thought, low brow. In Seattle I used to see nice old cars with wing windows in the door broken just to get in when the door was left unlocked. Some of these ppl would not have survived long in the caveman days if dinosaurs were present. Thanks for posting your misgivings about job boxes. You gave some descriptions of ways people have broken into job boxes on job sites, which I redacted. It would be a shame for anyone to learn any tricks here which would wind up putting readers’ guns in jeopardy. Your comment reiterates the importance of not getting a false sense of security about job boxes, or any security measures. Job boxes are great for those wanting something cheap to keep guns away from their kids, for not attracting attention like a gun safe, and for low brow burglars you described. They are not high security. But, they are not worse than cheaper gun safes as you point out. One difference I would mention is that a job box locked in a basement or garage is more secure than a desolate job site. Job sites generally have very little security, no one around to see/hear someone breaking in, they attract vandals and thieves, and most of the passers-by have pickup trucks and/or tools — which could be used to take or open the job box. We never used them on a site, either, although we moved around a lot anyway. For a home though, they have many uses if the guns outgrow the box. Awesome article. I’ve been through the flood disasters. I 100% agree with all your good advice. Seems very complete. Thank you. People should follow this advice. Personally i would get an average to cheap safe, store a couple cheapest guns in there and the really good stuff in a hidden wall (behind book case / etc)… This way they find safe, they find guns and think thats it. Also like mentioned in the article with contractors, etc… OPSEC is very important, if people don’t know you have guns, right there you solve a HUGE potential problem. I myself am a cable tech and go into many homes and you would be amazed what people let me see or don’t go through the trouble of concealing… oops, a 1911 mag there on the counter, a box of .308 over there… on many occasions… lucky for them I am an honest person! A lot of very useful information and a number of excellent but practical ideas. Some of the information and videos are concerning enough that I am re-thinking my gun storage strategy entirely. Thanks for putting together a wealth of information in one place. I stumbled across your article when researching gun safes as I am about to upgrade to a larger safe. A lot of food for thought here. If there are trees close enough to your driveway you can place a relatively inexpensive game camera on one of the trees. Set at the right height the camera may catch a license plate number and possible picture of the driver/burglar either coming onto or leaving the property. A license plate number will increase the possibility of the police tracking down a suspect. AGREE! I have two Cuddeback game cameras. One set up to take pics of the wildlife crossing my property at night (mostly deer and bear) and the other camera is set in the trees facing the driveway. Get perfect HD pictures with a time stamp of vehicles and persons entering or leaving the property. GREAT Article! Packed with practical, helpful advice and scores of ideas. Thank you!!! Great site, sucked up every one of my lunch breaks over the last 2 weeks. Easy to see you’re a passionate industry expert who cares more about helping consumers than making a buck or pitching a particular product. Wish there were many similar blogs out there, run by SMEs. Shared over 4 Survivalist FB forums and personally to a dozen similarly-minded friends. 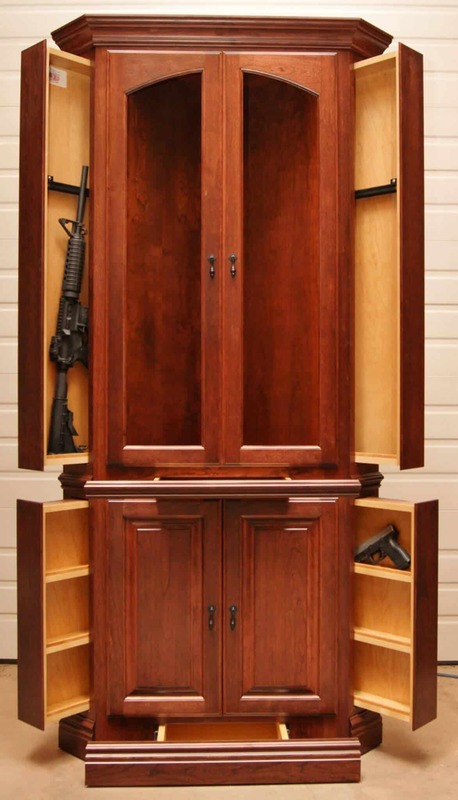 1) Is there any sort of dedicated Gun Safe Forum? I’ve found sections on anandtech, 1911forum, survivalistboards, ar15.com etc but nothing dedicated to the topic. Maybe a good opportunity for you? 2) After reading your blog and visiting a local safe showroom (NW Safe co in Enumclaw), I’ve come to the conclusion that a vault/armored closet would be best, supplemented by a something small in the bedroom. 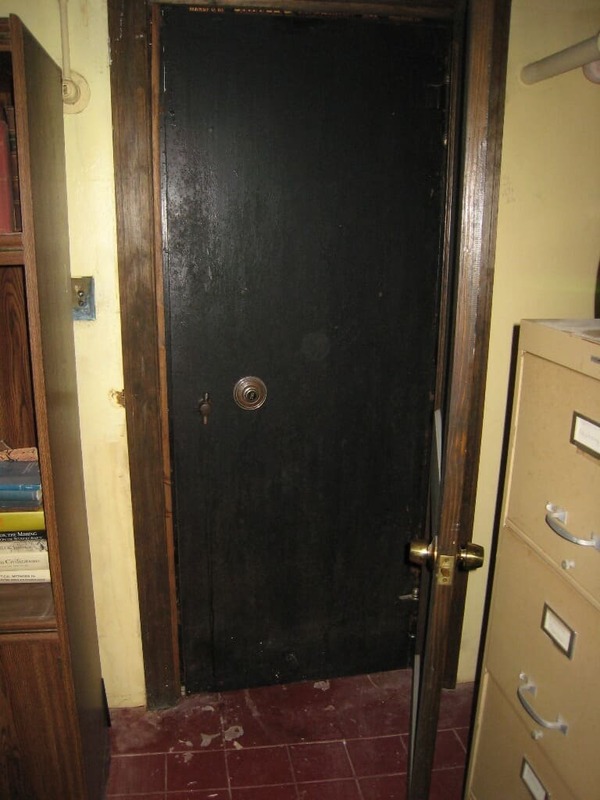 My question is about the “Closet Vault” door: – Does anyone have any good ideas about where to buy/how to make a decent metal door/jam/locks? My space is only a few feet wide/high so best idea I have come up with so far is to buy a wall safe big enough to crawl through and grind the backing off. 3) Does anyone make a “hardened” (i.e. wood-appearing steel and Plexiglas) gun cabinet like the Amish one? I have several older gentlemen friends who are adamant about wanting this style. Have scoured the Internet with little luck so far. Yes, I’m aware it wouldn’t hold up well to a determined attack. 4) FYI the “indiana jones” comment above is spam. Thanks for the kind words. Glad you’re finding the site useful, and thanks for sharing it! 1) There is no gun safe forum that I know of. Before I put this site together I thought quite a bit about the most effective way to get information to gun safe customers. I concluded that for most gun owners, gun safes are one time purchases. People do some research, buy one, and then move on to other concerns. Also, much like gun technology, sound safe and gun safe designs don’t change that often. So, I figured that other topics lend themselves better to frequent member engagement and forums. Instead I structured GSRG more like a reference than a blog or forum with constant new material. Speaking of forums, glad you patronized NW Safes. One of their safe techs has contributed a lot to ar15.com. 2) A reader sent me pictures of his similar approach to what you described. He took a floor safe, cut off the door, and cast it into a masonry feature in his house. He used a liner and waterproof membrane to protect the interior from moisture. The floor safe door opens to reveal a deep chamber sized for long guns. And since the chamber is built into the structure, it’s well hidden. Some brands of true safe use the same door frame for multiple grades of safe. E.g. the door frames for their B-Rate and C-Rate are actually the same. If you decided to go this way, you could buy the one with the thinnest walls, as you’d just be cutting them off anyway. Of course if the area you’re trying to protect is wood framed, this could be overkill without significant reinforcement to the walls. Another option is to build it yourself. 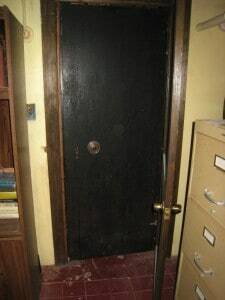 As you saw from the construction of the old vault door, the construction of a custom safe door can be relatively simple. The Graffunder pictures and cutaway show that the door frame of a true safe is primarily lots of steel. Of course DIY building a vault door, it’s not everything aligned and operating smoothly. But, if you’ve done some fabrication, you’ll have an intuition for how hard it would be for you to do. 3) There are hardened bed and couch products and lots of hidden furniture options. Some of the furniture diversion safes are lightly hardened, but I don’t know of any like you’re asking about. 4) Thanks, “indiana jones” snuck in but has been sent back to the Temple of Spam. This morning I’m reading about the shooter at Ohio State and finally decided it’s time to exercise my 2nd amendment rights. I’d figure out how to secure them first which is what led me here. Excellent ideas. The main problem around here is drug fueled break ins for which a hardened closet is probably best. Thanks. Three 100+lb dogs is all I’ve ever really needed to keep people from looking too closely to my house…….Especially Dori, who broke through the side window of my van to get at someone who was being a pest. Hahaha. Sounds like a good security system. Hey, just a quick note on clothing and books for hiding. It’s not very secure! When I was broken into the thieves stole guns & ammo, knives, etc. They went through all my cloths (took some too), stripped the bed, upended the mattresses, used pillow cases and sleeping bags to pack stuff off, went through every book and drawer, picture, and adding insult to injury, stole my leather bound bibles off the bed stand. Seriously, bibles???!!! Another note about clothing and books, just a few days ago, saw a news item on a local retired Sheriff that was burgled. They showed him in his living room. Every book and painting visible in the room was overturned. Looked a lot like my master bedroom 15 years earlier. Thieves are much smarter about looking for firearms and valuables, so really think the hiding strategies through. If it appears handy to grab near your chair, door, bed or not near a window easily observed from the outside, it will be searched! I am really enjoying the information on gun safes though. You have given a lot of food for thoughts! Thanks! Be careful with some job boxes. The long hinge pin can be removed from the back unless it is tack welded or stored in a location where the thief cannot drive it out. Great article and lots of good ideas for safe storage. 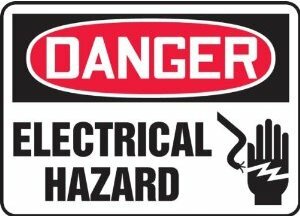 If you have a home alarm system, run a contact wire, through the electric hole. Wire it to your system (you can do this yourself, or hire a professional installer), and place a contact at the inside frame. This way, even if they get into the house without setting off the alarm and try to pry the door open, the alarm is set off. Thanks for all of the other great ideas! Thanks for this great repository of safe information etc. I’d note the importance of turning off geotags when posting smart phone pictures of firearms or your security measures online. That wasn’t Charlton Heston’s gun vault in the pic. Just saying. What about good hiding places instead. I have used the rafters in my garage for rifles and ammo. Not mentioned was the fact that if they find ammo, they know you likely have a gun. If you dont keep the riifles in boxes/cases, what are thr odds guys are going to climb around your garage rafters. I took an old mattress, slit the sides and it held 4 rifles. The i piled old clothes, photos, and other junk….up to the roof….so they just cant push it all off on to the floor….oh snd inscrewed the mattress down and put other rafters (using old dark wood…not new, so that it was all kind of wedged in there. Kind of a pain to get at for me….but with my ladder locked up outside….hard for them to get up there….whst do u think?